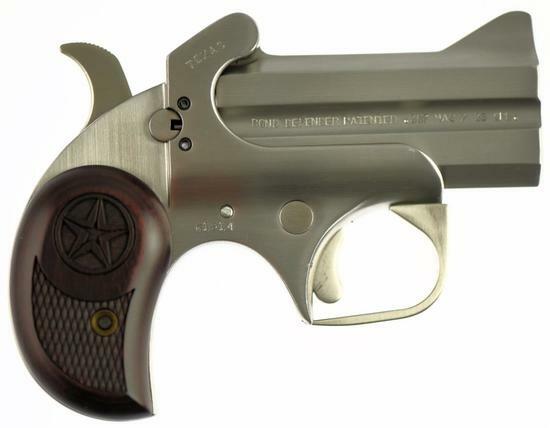 MANUFACTURER/IMP BY: BOND ARMS MODEL: TEXAS DEFENDER ACTION TYPE: DERRINGER CALIBER/GA: .357/38 SPL Serial #: 61914 BBL/OAL: 4.5" BBL. DESCRIPTION: Two Sets of Barrels Including .357 Mag./.38 Spl. and .45 LC/.410 shot shell cals., O/U design, compact stainless steel frame, 3 in. barrel, accepts all optional barrels, patented rebounding hammer, crossbolt safety, retracting firing pins, spring loaded cammed locking lever, trigger guard, satin finish, rosewood grips, 20 oz. New 1995. This Model is on MD's Handgun Roster and is Legal in MD. Includes carry Holster and original Box. .357 BBL's Test Fired/.45 LC Unfired according to owner. CATEGORY: REGULATED INVENTORY #: 2470. Derringer includes an Internal locking mechanism.